In 1871 Manchester Jewry was, as it still is, one of the most influential centres of Jewish life in England and, even if they had no family connections there, it was a good place for the boys to start working life. The 1871 census shows 17-year-old Levy and 15-year-old Jacob as lodgers in a cellar in Hanover Street, Manchester. Their landlady was a Russian-born leather cutter; they were described as travellers (travelling salesmen or peddlers). The oldest son, Isaac, born in Krakow in July 1852, lived in Manchester until his death in 1927. All three of the young men married in Manchester. After Levy and Rebecca Waxman married at the Great Synagogue, Prestwich, in 1875, they moved to London, living first in Bethnal Green and then in Hackney. A sad series of birth and death certificates shows three short-lived babies born to Levy and Rebecca, in 1876, 1877 and 1878. Levy’s occupation on each certificate was furrier. In time, Louis and all his sons except Manchester-based Isaac prospered in the fur trade and this was the time when Louis, Levy and Jacob were taking the first steps. However, Bankruptcy Court records show Louis and Jacob, trading as L Barder &Son, declared bankrupt in January 1878. The 1881 census has Jacob back in Manchester, trading as a fancy goods textile dealer and married there in 1880: and after their unhappy London experiences, whether or not Levy had been associated with his father and brother in their bankruptcy, the 1881 census shows Levy and Rebecca also back in Manchester and Levy occupied as a draper. However, by 1883 when Harry was born, the Levy Barders had moved on to Hull. Hull’s shipping links with Hamburg and Bremen had long played an important part in England’s trade links. During the Napoleonic Wars when channel ports were largely closed to commercial shipping, convoys were provided to protect merchant ships carrying exports from Hull to continental ports, and it was Manchester merchants who were most vociferous in demanding this protection. (A poignant memorial plaque to the Arctic convoys of the second world war, among other remembered battle honours on the Hull Cenotaph, suggests that the port played a similar part in more recent time.) For Levy and his brothers, seeking to establish themselves as import/export traders, a large warehouse near the docks in such a vital port must have seemed a canny business venture. Thus Levy was listed in the 1885 Kelly’s Directory as running a Fancy Goods Warehouse and Repository at 46 Whitefriargate which appears on the 1891 survey map of Hull as occupying a substantial area. As well as offering trading opportunities, Hull would also have been known to Levy as a landing place for many of the Jewish families who were arriving in increasing numbers from the 1840s onwards, usually in response to periodic imposition of yet harsher treatment of Jews, especially in the Russian Empire. 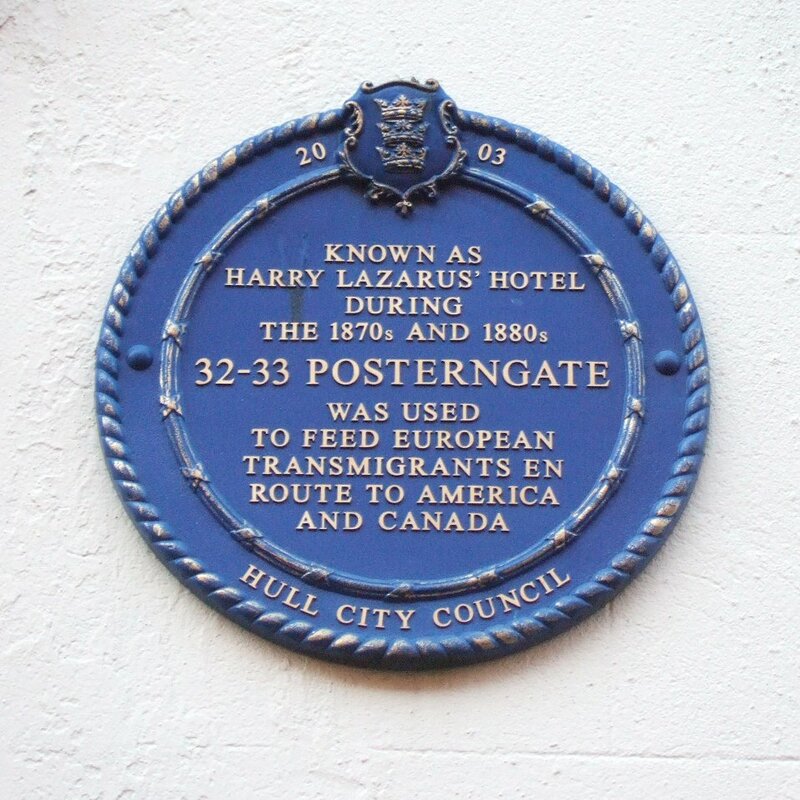 It is possible that Rebecca’s father, Abraham Waxman, had passed through Hull as he fled from Russian Poland to escape enforced conscription of Jews, stealing an internal passport to do so. (Only six Waxman births were registered in the UK between 1838 and 1875. The first two were in 1855, one in Hull, the other, Rebecca, in Manchester; two further births in Manchester were Rebecca’s short-lived brothers, and the other two were in Liverpool – following the railway). A growing railway network in continental Europe enabled potential emigrants of all creeds to reach Hamburg: by 1844 the Manchester-Leeds railway, the Leeds extension railway and the Manchester-Liverpool railway meant that, once arrived in Hull, the hopeful traveller could easily reach the port of Liverpool which in fast English steamships transhipped as many future Americans as any of the continental European ports. 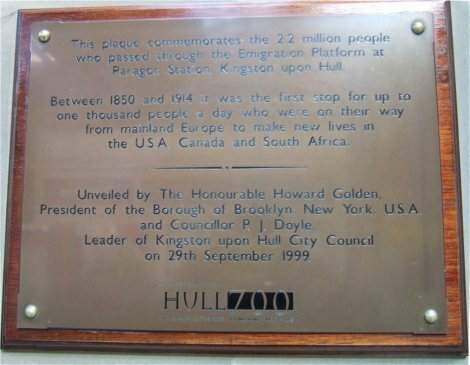 Jews presumably formed a large minority of the two million migrants who passed through Hull between 1850 and 1914, and Jewish communities to a large extent assumed responsibility for them. The motive was not entirely philanthropic concern for the welfare of the impoverished and frightened newcomers: there was also a determination that they should not be a burden on the UK authorities and bring the settled Jewish community into disrepute. Jewish relief organisations provided various forms of help and were especially concerned to help the migrants on their way to Liverpool and onto a ship. But inevitably, despite the best efforts of their anxious host communities, a significant number did settle along the way particularly in Manchester. It’s nicely put, but Louis Barder didn’t have a family business for his sons to work in and she possibly exaggerates not only the family devotion but also family rivalry. In fact, the fur shop at 26 College Green, Bristol, which Harry Barder owned and ran from around 1907 until late in in the 1940s, had been started by his uncle, Albert, in about 1887; it passed to another brother, Samuel, and then eventually through some unknown family arrangement to young Harry. It is possible that Samuel and Levy were in partnership for a while in a Kensington shop where Harry had worked. Trade directories show Samuel with shops successively in Kensington High Street, Brompton Road and Regent Street, but his 1947 will shows him as a retired furrier living in Coltman Street, Hull. Perhaps as a 16-year-old he had been a helper in the Fancy Goods business with Levy in Hull and returned in retirement to a street which was newly built in his youth. Meanwhile Harry’s Hull birth entitled him, years later, to be president of the Bristol Yorkshire Society. We found that his birthplace, Whitefriargate, had been for centuries the main shopping street of Hull, but its shopping supremacy has been surrendered to the largest number of shopping malls in a small area as we have seen anywhere in the world. The prettiest, Princes Quay, is built on stilts over the dock that Harry would have seen off Whitefriargate, with airy views of water and redundant warehouses newly commissioned as bars and restaurants. Whitefriargate is the usual English mixture of Georgian, Victorian, Edwardian, and Art Deco (lots of that), but viewed from ground level everything is defaced by hideous shop fronts. Apparently there had been hopes, but presumably no enforceable plans, to keep Whitefriargate as a boutique area when the shopping malls were built. Nevertheless a walk with eyes above ground level sees a lot that is attractive. The current building at number 46, the focus of our pilgrimage, was built in 1904, but its view remains one that the infant Harry, and perhaps Samuel, might have remembered. It stands opposite the Neptune Inn, built in 1794, a splendid long structure, its central pediment topped with the Trinity House arms. In 1883 it would have been serving as the Custom House. Sadly, Boots and adjoining shop fronts grossly mar its elegance on the ground floor. Leading off Whitefriargate is Parliament Street, a lovely row of Georgian houses, now mainly lawyers’ chambers, each with highly polished brass plate. The Paragon and Hepworth Arcades add a touch of Piccadilly elegance to a shopping tour of Hull Old Town. Whitefriargate itself ends with a typical Art Deco Burton store but in this case in black marble. It has the usual Burton’s feature of large Art Deco windows on the first floor which usually housed a hall of some kind, often planned for snooker. I used to go to Saturday night hops above the Burtons on Streatham High Road where a local band was so much nicer than a DJ would have been. Montague Burton himself arrived from Lithuania around 1900, possibly landing in Grimsby rather than Hull, and opened his first shop in Chesterfield, but in search of a synagogue moved on to Leeds. Like many proud provincial cities, Hull has its share of fine public buildings of Victorian and Edwardian vintage, with a statue of Queen Victoria in the square named after her as their centrepiece. Many were built at a time when Hull was the third most important UK port after London and Liverpool, and the largest fishing port. The Maritime Museum (formerly the Dock Office), the huge Guildhall, City Hall, and many imposing bank buildings are all suggestive of prosperity and confidence. Some of the banks are now pubs, adding to an already satisfactory number of such premises. A huge lavish Barclays Bank building of the late nineteenth century is now the William Wilberforce Bar: I wonder whether he would have approved. The George pub, with ‘the smallest window in England’, used by the pub landlord to look out for supplies smuggled in on the Humber and Hull Rivers, is in The Land of Green Ginger, the medieval spice market, a street off Whitefriargate. Another pub, Ye Olde White Hart, according to the recently published Pevsner Guide to Hull by David and Susan Neave, our bible for this visit, dates from the 1660s and was the residence of the deputy governor who plotted to overthrow the Catholic Governor of Hull in 1688, year of the Glorious Revolution. (A local legend that it was the site of plotters who refused Charles I access to the city is thus disproved.) We had our Sunday roast in the Punch Hotel, lavishly decorated outside, putting on no airs inside. It stands next to the Ferens Art Gallery, built in 1926, the gift of Thomas Ferens, one of William Wilberforce’s successors as MP for Hull, who also endowed the University of Hull. We enjoyed a post-lunch visit to the gallery, an enviable free resource for the worthies of Hull. Unfortunately because we were visiting on a Sunday we couldn’t be tourists in Holy Trinity Church, dating from the early fourteenth century, the largest parish church in England by area and one of the largest brick-built structures in the country. We crept in during a service and were amazed to find it crowded. Trinity Square and the surrounding areas are predictably attractive. Despite the fact that Trinity Church is not a cathedral, although cathedral-size, Hull, along with Bradford and Nottingham, became a city in 1897 in celebration of Queen Victoria’s Diamond Jubilee. In the oldest part of the city, which clustered along the River Hull from the mid-thirteenth century onwards, many eighteenth and early nineteenth century buildings, merchants’ houses, warehouses, fragments of some seventeenth century houses, and later nineteenth century buildings have survived. They now lead to the Museum Quarter where a cluster of free museums of Hull life include the charming seventeenth century house where William Wilberforce was born in 1759, and baptised in Holy Trinity. In the 1680s the house had been the official residence of the Governor of Hull but was owned by the Wilberforce family from 1730 till 1832. Why Hull had a governor did not become clear to us during our visit. William Wilberforce played no part in the Barder family history but he did have a tangential connection with Pastor Christopher Frederic Triebner, Brian Barder’s many times great-grandfather on his maternal side. The German-born and Halle University-educated pastor had arrived with his family in England in the 1780s as a refugee from the victorious and newly independent United States. Since 1769, he had been ministering to a group of German Lutherans who had been expelled from Salzburg by the Roman Catholic Prince Archbishop in 1731, and found refuge in the newly created colony of Georgia in 1734, with the goodwill of Hanoverian (and Lutheran) George II. His wife, Frederica Gronau, was a daughter of the young pastor who had accompanied the first ship-load to arrive in Savannah and had married one of those expelled. During the American Revolution Triebner had maintained loyalty to the British Crown, his preaching and arguments possibly contributing to the fact that Georgia was late in joining the demands for independence. He was active in the British military effort, and as a consequence joined the retreating troops. In fact he was officially expelled from the new United States, although this expulsion was later rescinded, and one of his sons returned to Georgia as judge; the other became the founding father of all UK Triebners. The Pastor’s loyal efforts enabled him to claim compensation from the British government for “the loss of his Negroes” as well as of his books, land and other property. Once in the UK he spent some years in London employed as a preacher in various of the German churches, and in his spare time he was a prolific writer of polemical pamphlets, a sort of early blogger. However, in 1802 a petition was presented to the Justices of the Peace in Hull, asking that Christophe Frederic Triebner, who had been requested by Samuel Thornton and John Boys Esqrs. Of Hull to preach the Word of God to Germans employed in their sugar houses and others in Hull, should be licensed to do so. Permission was granted and the Pastor continued to combine preaching with pamphleteering. Three of his religious pamphlets were published in Hull and are held in the Hull University Library: others appear in the catalogue of the British Library. After a few years the Triebner family moved to Leeds where the Pastor died in 1815. Samuel Thornton, whose German employees needed Triebner’s pastoral attentions, succeeded his cousin William Wilberforce as MP for Hull and, like his brother, Henry Thornton, was a member of the Clapham Sect. William Wilberforce’s grandfather and Samuel Thornton’s father had both created the family fortunes in the Baltic trade, which helped to fund their sons’ political and philanthropic activities. Like these Hull businessmen, Pastor Triebner’s son and grandson also became wealthy men as Russia brokers and in trading with the Baltic. Timothy Traugott Triebner, born in Georgia in 1776, would undoubtedly have started his working life when living with his father in Hull and it seems highly possible that he could have learned from the Thornton business, even if not directly employed in it. Unfortunately the fortune built up by Timothy and his son, another Timothy, did not outlast the younger Timothy. Near Princes Quay we photographed a splendid warehouse emblazoned with the name Sugar Mill. It was not in fact an old sugar mill and certainly not one of those owned by Samuel Thornton but it was a suggestion of another aspect of the family history roots in Hull. Different circumstances brought these immigrant ancestors to England: Abraham Waxman escaping punitive conscription by the repressive and anti-Jewish Russian regime; the young Barders living in comparative prosperity under a light-touch Austrian regime in the Jewish quarter of Krakow but leaving to make their own way in a foreign country; Christopher Triebner, bringing his wife and family to seek refuge in England, following expulsion from the young United States and the expulsion of his wife’s family from Salzburg. For all of them, time in Hull played some part in their new lives in England. We now realise that we were lucky to have seen so much of relevance to the lives of our family in Hull. Apparently, after London, it was the most badly bombed city in England during the Second World War. David and Susan Neave state that of the city’s 92,660 houses, only 5,945 were undamaged. Five main department stores and nearly half the principal shops were destroyed. Figures in the Wikipedia Hull entry claim that of a population of around 320,000 at the beginning of the war, 192,000 were made homeless (the Neaves’ figure is 152,000 homeless). Both give 1,200 as the number killed and Wikipedia says 3,000 were injured. The port and its nearness to mainland Europe which gave it its livelihood presumably drew the bombers. Perhaps the fact that much of the Old Town is Hull River-centred, rather than on the vast Humber, spared it from the worst of the bombing. Even before the war’s end Hull was planning its rebuilding and, nothing but the best, in 1944, commissioned Sir Edward Luytens and Sir Patrick Abercrombie to design the post-war reconstruction of the city. As in London, for which Abercrombie also designed a plan, little came of his plans for Hull. But Hull had its own architectural roots. Leslie Martin, known for his work on the Royal Festival Hall and as chief architect at the sorely missed London County Council, in 1934 at the age of 26, became the principal of what later became the Hull School of Architecture and for the five years he was there he was an influential force in architectural education in the city. It’s appropriate that in the 1960s he designed many of the buildings for the University of Hull. I can’t finish without mentioning the white telephone boxes, of Sir Giles Gilbert Scott’s design but without the crown, and white because Hull from 1902 had a licence to operate its own, municipal telephone system, not subject to the Post Office monopoly. It was privatised in 1999 – did John Prescott, another of William Wilberforce’s successors know that? We asked in the tourist and information office why they had no white souvenir telephone boxes for sale, only red. The answer was that the Japanese and Asian students, who are apparently their major customers, are only interested in the red telephone boxes which they see as a symbol of England. We were glad to have spent two days in Hull and we shall gladly return one day.